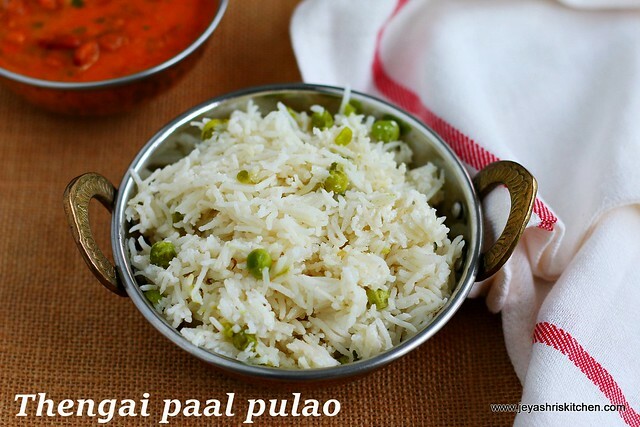 Coconut milk pulao is a simple pulao recipe, where the basmati rice is cooked with aromatic spices and coconut milk, served with a spicy gravy. Amma rarely makes this thengai paal sadam, which she learnt from her friend. 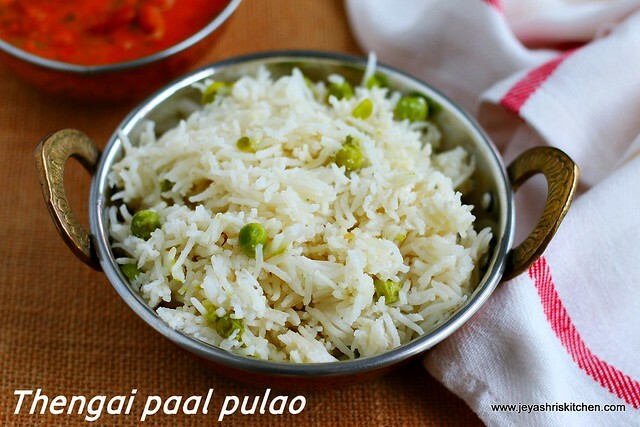 But we will look forward to this yummy rice and the combo at our home with be spicy aloo subzi. I still remember one of those rainy days, after i delivered Varun, i pestered amma to make this combo of coconut milk pulao and aloo subzi, and literally feasted on it. I used store bought coconut milk. You can use home made coconut milk too. Wash the rice and soak it in 1 cup water and 1/2 cup coconut milk. In a pressure cooker add oil and add the bay leaf, cinnamon stick and green chili. Slit the green chili and put it. Saute for few seconds and add the soaked rice. Add green peas, if using. Cover the cooker with the lid. Pressure cook till 2 whistles. Once the pressure subsides, open the cooker and mix it gently. If needed garnish with coriander leaves or mint leaves. Serve hot with any spicy gravy. We had with rajma masala. You can add carrot,potato and beans along with green peas. You can add few more whole spices such as marati moggu, cardamom also. Finely chopped mint leaves and onions can also be added with whole spices. The coconut milk pulao goes well with spicy paneer gravy too. Thank you so much. Thanks for trying out and giving me the feedback. The meaning of this is that you actually burn fat by consuming coconut fats (including coconut milk, coconut cream and coconut oil). I never heard of coconut milk pulao before. It looks yummy. I will definitely try this out very soon. Thank-you so much mam for posting such a unique recipe.